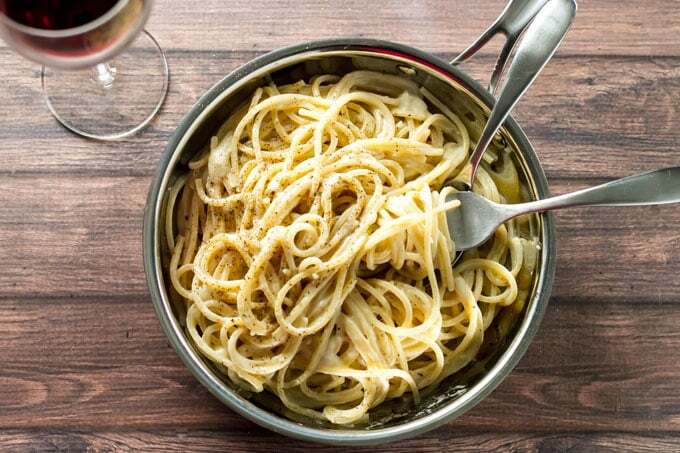 Inspired by the classic Roman dish Cacio e Pepe this roasted garlic pasta needs only 15 minutes and five ingredients to go from pan to plate. 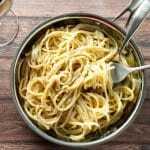 A few weeks ago I discovered a recipe for Cacio a Pepe by Marc Bittman a simple, basic pasta dish made only with pasta, butter, cheese, and black pepper. The key to the dish is to combine everything with a healthy splash of starchy pasta water and toss, toss, toss until the liquid emulsifies with the butter and cheese creating a creamy sauce. Intrigued I used his recipe as a blueprint to create a warm and cheesy roasted garlic pasta – a dish that comes together so quickly you’ll be cozied up with a big bowl in just 15 minutes flat. Remember the roasted garlic post from Friday? This pasta is the reason to always have some on hand – trust me, it’s the right thing to do. The process is almost identical to the original – boil some pasta and while it’s bubbling away, melt some butter in a separate pan over medium-low heat. Once it’s frothy, add the roasted garlic and stir it all around in the butter. Immediately transfer the cooked pasta to the butter and roasted garlic before adding the cheese a little bit at a time. Next, be bold! You’re going to need to stir, stir, stir. The stirring part is a bit of an art. It’s at this point a 1/2 cup of the starchy pasta will come in handy and you’ll want to add a little at a time to help emulsify the sauce. I find adding the cheese in batches reduces the risk of cheesy lumps and is your best bet for a smooth and creamy sauce. Also, I recommend doing all the stirring and sauce making in the same pan used to melt the butter. Mark Bittman uses a bowl to combine everything but, after reading through the comments on his recipe, I thought this was a little too high risk. I recommend a hot pan because the heat will help keep things moving. 5 ingredients and 15 minutes – do you need more convincing? While the pasta is cooking, melt the butter over low heat. Add the roasted garlic and stir it around while sort of mashing it in the butter. Turn off the heat. 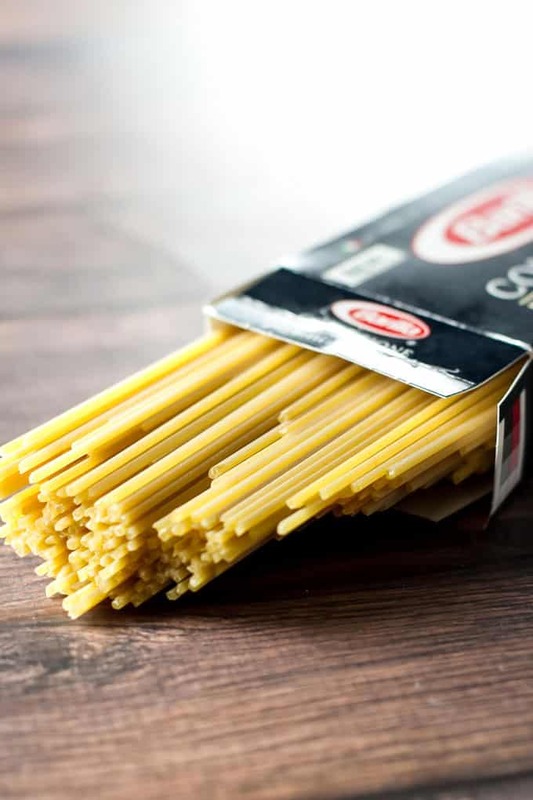 Transfer the pasta from the boiling water to the pan with the butter using tongs. Reserve 1/2 cup or so of the cooking water. Toss the pasta in the butter and garlic. Add both the starchy pasta water and the cheese a little bit at a time and continue tossing the pasta until the cheese has melted and the pasta is coated in a creamy sauce. if needed, turn the burner on low to help things along with more heat. Garnish with ground black pepper, to taste. Trying this tonight, but without the cheese, and my fiancé is allergic. The smell of the roasted garlic is making my house smell like a trattoria! My husband’s friend makes a mean bowl of cacio e pepe I will have to tell him to add some roasted garlic next time! Looks amazing. I could eat something like this every day! Yum! 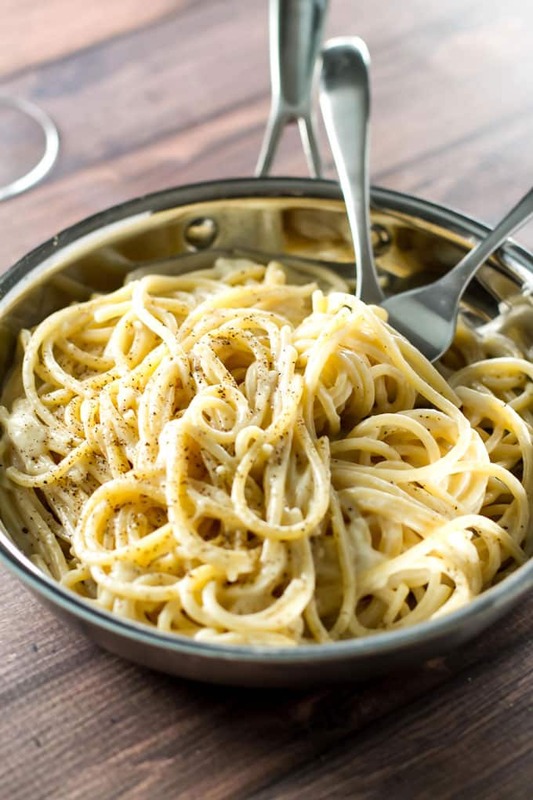 Cacio e pepe is on of my absolute favorite dishes. Along with bucatini all’amatriciana. 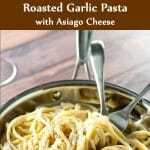 Next time I make a bowl of cacio e pepe, i’ll toss in a handful of roasted garlic! Welcome to Yum Goggle! We are following you on ALL social media and hope you will follow us back. We will do our best to tag you each time we promote your posts. Kelli at YG. This sounds incredible! i love an easy dinner that is packed with flavor! This is going on my weeknight menu! I love the idea of a simple pasta dinner that is easy to make on any weekday night. Can’t go wrong with this recipe. Yum.